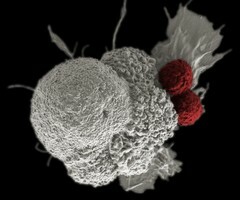 Shown here is a pseudo-colored scanning electron micrograph of an oral squamous cancer cell (white) being attacked by two cytotoxic T cells (red), part of a natural immune response. Nanomedicine researchers are creating personalized cancer vaccines by loading neoantigens identified from the patient's tumor into nanoparticles. When presented with immune stimulants, this activates the patient's own immune system, leading to expansion of tumor-specific cytotoxic T cells.